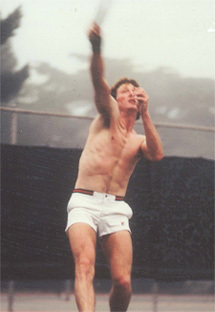 That's me playing in the 1980's in the days of Fila shorts. As Allen Fox once said there are two ways to win matches. Beat the player to death with your strengths, or vary your shots and adapt your game to your opponent. In the first variation, you need to be the better player. In the second you don't necessarily. You just need to find a way to win more points. This article is different—a personal account of playing and winning matches in the real world. Starting in the early 1980's, over a 15 year period, I played NTRP tournaments, Norcal Seniors tournaments, and league matches. I was ranked in the top 10 several times in the 4.5's and won two 4.5 tournaments 10 years apart—back when that meant winning 7 matches in 9 days. I was also ranked in the top 20 in Norcal seniors and in the 5.5 NTRPs. I had a solid all-around game, moved well, and was, let's say, competitive. But no dominating weapons. Most of the matches I won I tried to get every first serve and every return in play and then figure out the best backcourt diagonal to get errors from opponents and/or openings for winners or to go in. But since my game wasn't dominating, that didn't always work. So I learned to vary my play to exploit the games of various opponents. There was a huge variety in ability and playing styles in those tournaments. Finding ways to win was challenging and fun.